Carl Barks has made at least three different versions of the Duck Family Tree, which were just sketches, with names but no pictures of the characters. The first version is from the early 1950s, made only for private use. It has been published in an article in The Carl Barks Library, set 6, page 476, together with Mark Worden's 1981 illustrated version. This page also shows an illustrated version by Mark Worden. Here is an extract of the article :"Carl Barks has done more than any other artist to knit the Disney ducks into a cohesive family. 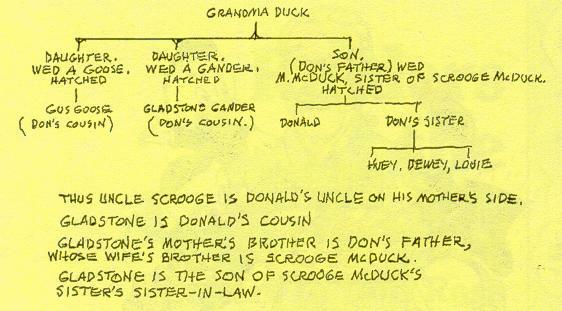 Barks roughed out this genealogy in the early 1950s, when he was evolving Duckburg and creating a sense of community around Donald..."
According to the article, this family tree was reproduced in a fanzine prior to Worden's 1981 illustrated version. According to Don Rosa, the original has been given to a fan, probably before this first publication. "My records are lost and my memory is defunct. About whether Goosetave or Goosetail was the name I gave to the gander who married Uncle Scrooge's sister is lost, too, in the senile fog of my recollection procresses. I will vote for Goosetave. It sounds more North European, the natural home latitudes of ducks and geese." "In March 1991 Barks roughed out a new family tree for his ducks, working backward from references in "Race to the South Seas". To make it tally with the genealogy he had devised in the 1950s, he later added in Old "Scotty" McDuck and provided names for Grandma's children." Barks received version 1 thanks to Don Rosa after having made version 2. Version 3 is based on both versions. According to the article, as you can read above, this updated tree includes Old "Scotty" McDuck and provides names for Grandma's children, which is wrong : according to Don Rosa, this tree is a xerox of the first one on which Barks pencilled in "Old Scotty" and Scrooge's two sisters Matilda and Hortense, but didn't add anything about Grandma's children. This version is described in the same article from Uncle Scrooge Adventures No. 42, but it remains unpublished. "Thanks for sending the "legendary" family tree, which I recognize as my work and which I evidently whipped out without a great deal of serious thinking. It jibes closely with my new tree, of which I enclose an updated copy that shows the two differ only in the origin of Gus Goose. The fancy hand-drawn family tree with the pictures of figmentary relatives was concocted by Mark Worden. I had no input on that one. However, it goes to show you how many names carelessly dropped into stories can inspire other writers to invent duck family relatives.